So, winter is very nearly upon us, and no, I never did find a Yellow-headed Blackbird. It has snowed in Montana, it has snowed at the Olde Homestead, and I have commenced my annual Andy Rooney-like wails of anguish about the earlier and earlier appearance of holiday decorations in stores. It’s time, if the time is ever, to get serious about this Gray-crowned Rosy-finch mission. In most of North America, winter is finch time. Some finches flock conveniently to feeders: House Finches, Purple Finches, Goldfinches of all types, and for the fortunate, Evening Grosbeaks. 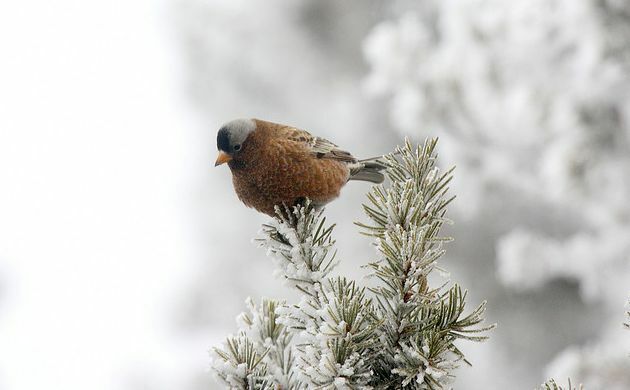 Others, like the Crossbills and the Pine Grosbeak, must usually be sought in the coniferous trees they favor most. The Gray-crowned Rosy Finch, when she abandons her breeding grounds, prefers to forage on the ground, similar to (and sometimes in company with) Snow Buntings, Horned Larks, and Longspurs. They are high-altitude birds, and will only come as far down the slopes as they are forced to by the weather. I, on the other hand, am a creature of the lowlands. Besides my little tiny no-car problem, I tend to huff and puff at high altitudes; a noise so much like a very hungry badger that any sensible bird will disappear long before I come into view. Besides, I’ve read Into Thin Air. I know what could happen. Fortunately, my interest in Rosy-finches aligns very neatly with the winter interests of many of my non-birding Missoula friends. Many of them pray earnestly for snow. Many of them drive weekly into the mountains, so much so that convenient parking lots and bars have been created specifically for their use. Downhill skiers, I hope, will be my key to Rosy-finch success; I will tag along with them, I will wander until I find my birds, and then I will drink hot cocoa and chat with whoever has the most interesting leg cast at the bar. Like many mountain birds, Gray-crowned Rosy Finches are said to show little fear of humans, so hopefully all the hustle and bustle will only be in my favor as rescue will be on hand if I run out of oxygen or fall down. I could hope to pick up some other birds, as well. A few winters ago all my skier friends were regaling me with tales of a hyper-aggressive Spruce Grouse who was guarding one of the trails at the ever-so-creatively-named Snow Bowl. eBird also shows records of Great Horned, Flammulated, and Northern Saw-whet Owls on Snow Bowl Road. The only downside, as I see it, is the money involved, and perhaps too many hot chocolate calories. And the fact that I have no idea if Rosy-finches actually hang out at Snow Bowl, only a vague desire for hot chocolate. Will it work? Stay tuned to find out. Sandia Peak outside Albuquerque is a dead cert for all 3 Rosy Finches. It is possible to sit in the cafe at the peak and see all 3 finches at the feeder whilst drinking hot chocolate. Good luck, Carrie, good luck. And hot chocolate calories are negligible, really. I#ve heard that the more you drink, the less calories they have.